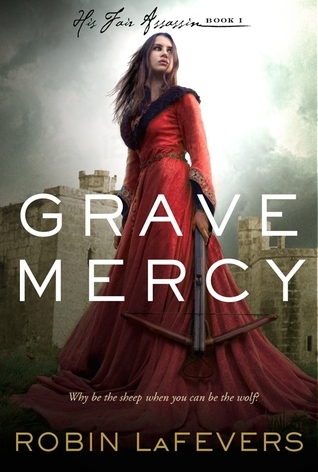 Grave Mercy follows Ismae, who serves the God of Death at the convent of St. Mortain. There, she has trained to be an expert assassin. However, her most recent assignment has her maneuvering the politics of the high court of Brittany, where she must decide if she is to follow her heart or her orders. This is the book that made me fall in love with political intrigue. There is so much going on, with different plot threads and motivations in play. However, this book can feel very slow. It’s a little on the longer side, and there are times when you can tell. The plot moves slowly as Ismae learns more about the court. That said, if you’re willing to bear with it, it is so worth it! I loved this setting. I went in knowing nothing about Brittany in the 1400’s, but I left wanting to know even more. Robin LaFevers perfectly shows this world of politics and treason, with her own added mythology that is absolutely fascinating. It helps make this book the truly unique read it is. Ismae is such an amazing protagonist. She’s strong and smart, but still has flaws. The love interest, Duval, is a really interesting character. Their romance was absolutely adorable! It definitely does take up a big part of the plot, but I had no issue with that. All of the side characters are well developed, which is great because some of them end up with their own books! Grave Mercy is captivating, with a mythology sure to enthrall you and a web of politics and lies that only grows deeper and deeper the more you untangle it. Amazing review!! 😀 😀 I love this book! Thank you!!! This book is one of my favorites, it’s so good! I loved reading this series – female assassins are the way to my heart! It’s definitely underrated, IMO.